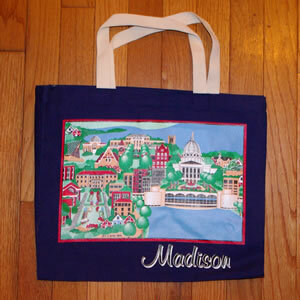 This stylized “mosaic” of Madison landmarks brings up-to-date a design created as a card for a visiting English family to convey an impression of Madison to friends in England. Buildings, from west to east (but not quite where you expect them!) include: The Unitarian Meeting House, buildings of the UW College of Agricultural and Life Sciences - Henry Mall leading up to Ag Hall and Russell Labs (where the designer worked as a plant pathologist). Music, Science, North, South and Bascom Halls are on Bascom Hill. Washburn Observatory and the Carillon Tower overlook University Bay, Lake Mendota and Picnic Point. 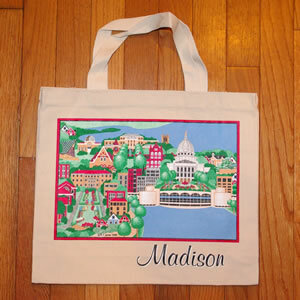 Clusters of houses, a church steeple and office buildings complete the view across Lake Monona to the Monona Terrace Convention Center and the Capitol building on the isthmus between the two lakes. The Conservatory at Olbrich Gardens is at the far right. Augusta Sportswear GUSSET TOTE - 11 ounce 100% cotton canvas | Natural web handles reinforced at stress points | 4-inch side and bottom gusset 15" x 12" x 4"